Is this the first published use of the term ‘psychogeography’? 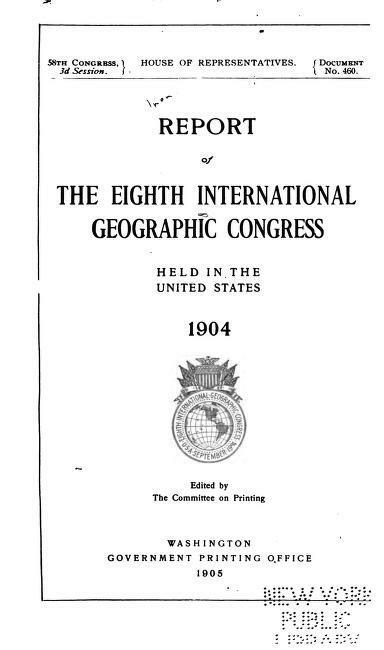 Presented in a paper ‘Climate and Cult’ published in the Report of the Eighth International Geographic Congress. 1904, pp.664-670, (Washington: Washington Government Printing Office, 1905). Jesse Walter Fewkes (1850 – 1930) was born in Newton, Massachusetts and initially pursued a career as a marine zoologist at Harvard. From 1887, he turned his attention to anthropology and ethnological studies, particularly the culture and history of the Pueblo Native Americans. Fewkes made some of the first recordings of their music. In 1895 he embarked on various archaeological explorations of the American Southwest for the Smithsonian’s Bureau of American Ethnology. In 1918 he was appointed chief of the Bureau and retired in 1928, dying two years later. The paper Fewkes presented to the Congress examines the relationship between climate, food supply and ritual ceremony, (what Fewkes calls ‘cult’). One example given is the rain ceremonies of the Hopi people. Fewkes argues that the Hopi’s strong connection with their arid landscape led them to develop a set of beliefs, practices and rituals to appeal to the sky gods to deliver rain. In these ceremonies, the gods are represented through masks, idols and other symbols and in order to influence the “magic powers of these personages” the worshipper employs signs or gestures, songs, verbal incantations or rituals of imitation. For example, water is poured into a medicine bowl from its four sides to show that water is desired from all world quarters; a cloud of smoke represents a rain cloud. Sacred kivas (rooms used for rituals) are painted with symbols of falling rain and lightning to remind the gods of the Hopi people’s need for water. As a conference paper, it is very much of its time but interesting in that it specifically mentions ‘psychogeography’ and clearly relates this to a linkage between the effect of the environment on the human mind. We have never seen it referenced before in any of the psychogeographic literature. Psychogeography sets for itself the study of the precise laws and specific effects of the geographical environment, whether consciously organised or not, on the emotions and behavior of individuals. Whilst the Letterists and Situationists clearly developed their psychogeographic activities, during the 1950s, in an urban environment, it is interesting to learn that the relationship between the environment and the human mind was being considered as ‘psychogeography’ in a non-urban context at the turn of the century. Now playing: Éliane Radigue – Elemental II. This entry was posted in Ephemera - Signs and Signifiers, Psychogeography and tagged Bureau of American Ethnology, ceremonies, Climate and Cult, Fife Psychogeographical Collective, Guy Debord, Hopi, Introduction to a Critique of Urban Geography, J. Walter Fewkes, Jesse Walter Fewkes, Lettristes, magic, psychogeography, Pueblo, rain dance, Report of the Eighth International Geographic Congress. 1904, ritual, Situationists. Bookmark the permalink. 6 Responses to Is this the first published use of the term ‘psychogeography’? Interesting…this does highlight the division between the situationist ‘political’ use of the term (utilising psychogeography as a means of changing the world?) and everything that bubbles up from the Sinclair et al quasi-mystical wellspring…Marx versus Magick. Maybe we need to introduce some subtle code into the lexicography to differentiate. ha ha – yes indeed! I’ve not heard this new one yet but love Ambarchi. Difficult to keep up with his prolific output. Cheers.